A little over two years later another girl would be found lying in the grass in the same neighborhood; but in a terrible reversal of the foundling, the girl, Eula Phillips, daughter-in-law of Sophia Phillips, would be found murdered. Like the foundling, Eula would be placed in the care of Sallie Mack who was given the heartbreaking task of cleaning Eula’s lifeless, battered body in preparation for burial the following day. Unidentified albumen print. Austin, TX. 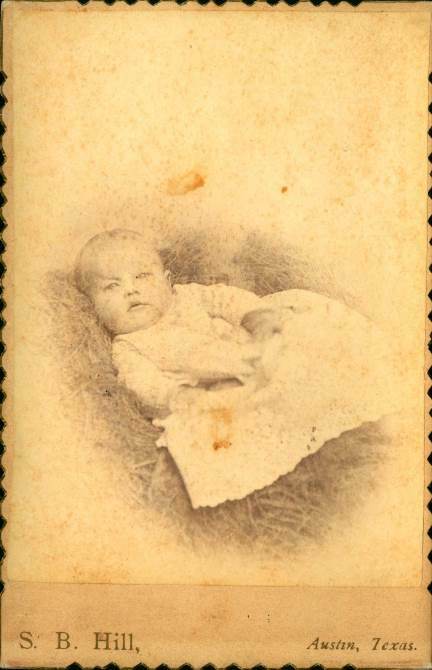 Sallie Mack (1830 – 1919?) was born in Virginia about 1830. Records indicate she was living in Texas by the 1850s and she was perhaps in Austin by that time but she doesn’t show up in city records until her marriage to Barney Cook in Austin in 1876. (Although married to Cook, she evidently still went by the name Mack and all four of her adult children used Mack as a surname. )* In 1885 Sallie and Barney lived on Colorado Street across from City Hall, about a block east of the Phillips residence. Sallie Mack is listed in Travis County Census through 1910 and in the City Directory through 1918, living with her granddaughter Jeanetta Addison and great-granddaughter, Erma. Sallie Mack was evidently a resilient woman who had spent her life attending the needs of her family and her neighbors and was evidently a well-respected member of the community. The same could not be said of her son, Alex Mack, whose criminal history and reputation did him no favors when he was found in the vicinity of the Ramey murder in August of 1885. According to police, Mack fled the scene and was apprehended after being pursued by bloodhounds. Marshal Grooms Lee considered Mack a prime suspect but he did not have enough evidence against Mack to get an indictment against him for murder. Alexander Mack (1857- ? ), born in Texas, Sallie Mack’s oldest son, Alex, had the notoriety of being one of Austin’s most frequently arrested citizens, with charges ranging from drunk and disorderly conduct and fighting to petty theft. In the early 1880s he worked in the Club House Saloon on Congress Avenue. He eventually served time in the State Penitentiary in Huntsville and there are records of him being arrested in Austin into the late 1890s. On the night of 3 October 1885 Alex Mack was taken into custody by Marshal Lee and police officers James Conner and Isaiah Johnson. Accompanying them were two Pinkerton detectives who had been brought in to work on the case after the Ramey murder. According to a statement given by Alex Mack to the Austin Dispatch, the officers beat him and staged a mock lynching in order to extract a confession from him. At that time Pinkerton Agents were notorious for their strong-arm tactics and the Mack incident reflects the Pinkerton’s modus operandi of brute force and intimidation to achieve their desired results. However in this instance the plan backfired when Mack did not confess or cooperate. Afterwards Mack told the story of his abuse while in police custody to the Austin Dispatch. Marshal Lee offered his rebuttal to the charges in the Austin Daily Statesman saying Mack’s injuries were only the result of his own struggles against lawful arrest. The Austin City Council authorized a select committee to look into the incident and the committee (whose members included Jesse Driskill and former sheriff, Radcliff Platt) heard testimony from witnesses including Sallie Mack, who testified on behalf of her son. Marshal Lee, Officers Conner and Johnson declined to appear before the committee. Soon afterwards, Sallie Mack made another appearance in an Austin courtroom – at the trial of Sophia Phillips’s son James for the murder of his wife Eula. Sophia Todd Phillips (1826-1888) was born in South Carolina as was her husband James. The Phillips were married in South Carolina; they briefly lived in Louisiana before eventually settling in Austin, Texas in 1855. James Phillips was a builder and had a carpentry shop on the premises of the Phillips residence. They had five daughters (including a set of twins) and one son, James Jr. There are some striking similarities between the Mack and the Phillips families: both families had lived in Austin since the 1850s and had likely lived in the same neighborhood for much of that time. Sophia and Sallie were approximately the same age. Sophia Phillips had six children, Sallie Mack had four that are known. Sallie Mack undoubtedly made herself available to neighborhood families that needed domestic help and the Phillips would have employed her on occasion. The parallels between the Phillips and Mack families in relation to the Servant Girl Murders are also notable. Both Sophia’s son James and Sallie’s son Alex came under suspicion in connection with the Servant Girl Murders, although for different crimes under different circumstances. While James Phillips’s treatment at the hands of local law enforcement does not compare to what happened to Alex Mack, James Phillips was actually convicted of murder by an Austin jury. In a turn of events that might be considered surprising for the time period, Alex Mack was exonerated of the charges against him and the police officers who abused Mack that were held to account for their treatment of him. James Phillips, Jr. (1861-1929) was born in Austin. James married Eula Burditt in 1883 and had one son, Thomas, in 1884. James was tried and found guilty of the murder of his wife Eula in 1886. That conviction was overturned by the Texas Court of Appeals later that year. James’s brief tumultuous marriage to Eula was documented in unflattering detail by the local newspapers in which he was portrayed as an immature, jealous, drunkard; however it is unfair to judge his entire life by the negative press he received for a few weeks in 1886. The Austin City Directory listed James’s occupation as “teamster” in the late 1880s. James continued living at the family residence until 1891 when he married Ida Hart. The couple moved to Georgetown, Texas and over the years James worked variously as a farmer, a music teacher and a carpenter. (Interestingly, the Phillips lived next door to J. Frank Dobie while Dobie was a student at Southwestern University). James and Ida went on to raise four children before Ida’s untimely death in 1910 at the age of 41. James and Ida Phillips have numerous descendants still living in Texas. The Phillips residence on Hickory Street was sold and demolished in 1891. 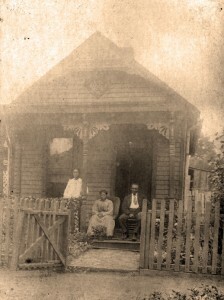 James Phillips Sr. and Thomas Phillips moved in with George and Dora Allen, James’s older sister. James Phillips Sr. died in 1909. Sophia Phillips’s other daughters remained in Austin and were married and had families, many of whom spent the rest of their lives in Austin. * African American wives would sometimes keep the last name of a deceased husband to memorialize their affection and respect for the late husband. 1. Austin Weekly Statesman 19 July 1883. 2. James Phillips vs. The State. Reports of Cases Argued and Adjudged in the Court of Appeals of Texas. 1883-1889. Austin : Hutchings Printing. All photographs from the collection of the author. Proudly powered by WordPress. Theme: Book by WPshoppe.